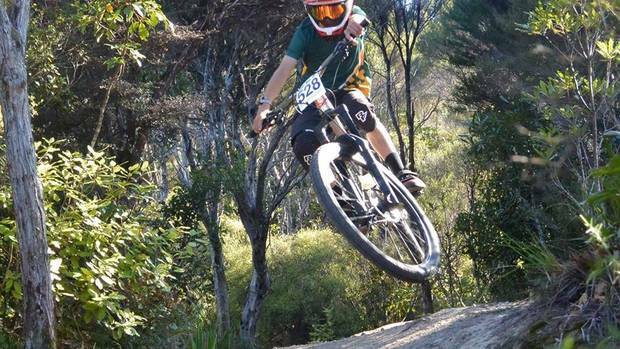 George Davy finished fifth in the Enduro division at the NZ Schools North Island Mountain Bike Championships. There was great success for a handful of Whanganui riders at the recent NZ Schools North Island Mountain Bike Championships. Held on the same March 29-30 weekend as the South Island championships, conditions were very hot at the Waiu Trail Park in Wainuiomata, around 30 minutes from Wellington. There were cross country individual, relay, and enduro divisions for riders in the Under 13 to Under 20 age groups to contest. Five Whanganui students attended the event. Racing against 10 other riders in the Under 14 Boys division, Alastair Cameron won the 15km race, completing it in 52m 50.97s. Katie Ramage, who earlier in March came third in the Under 15 Girls race of the full NZ Mountain Bike Cross-Country Champs in Rotorua, was the winner of the U15 Girls title in Wainuiomata, athough in a smaller field of two, finishing in 60m 59.60s. The younger Ramage, Jennifer, was fourth among five riders in the Under 13 girls race, which she completed in 1h 23m 39.09s. Hadley Wilson was sixth among nine riders in the Under 13 boys, finishing in 1h 10m 18.97s. WHS student, George Davey entered the enduro section and in a big field of 26 riders for the Under 15 boys, finished fifth overall, as briefly coming off his bike narrowly cost him a place on the podium. Davey won the Under 15 title of the Wellington Mountain Bike Club's Enduro Series last year, and is likely to be crowned the points winner again with the 2019 series concludes. The national school mountain bike championships will be held on October 4-6 in Dunedin.